Give your kids (and yourself) the energy they need to make it through the day with a healthy lunch. Studies have shown that if you equip children with healthy food to eat at school (work), they will be better prepared to study and learn. Although there are lots of convenience products available to make packing your kid’s lunchbox a snap, those products are often loaded with saturated fat, calories and sodium. Kid-friendly ideas take little time to prepare and will help keep lunches enjoyable and healthy. Fruits and vegetables add color and crunch while providing beneficial vitamins and minerals. Foods like wraps, smoothies and dips are fun to eat. So here are some ideas of quick lunches, or lunches that can be made ahead and ready to go. These options fit nicely inside Ziploc divided containers (or something of the like) for easy transport. 1. Leftover homemade chicken nuggets (served cold) with honey mustard for dipping, plain yogurt mixed with a little pure maple syrup and pomegranate seeds, cucumbers and carrots. 2. Peanut butter and honey with banana slices on whole-wheat tortilla wrap, cucumber slices, watermelon, plain yogurt mixed with a little pure maple syrup, a dash of vanilla extract and blueberries. 3. 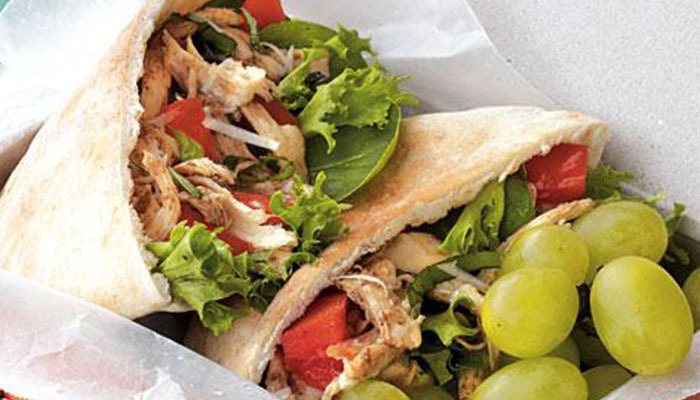 Chicken salad with chopped cucumber and grapes in a pita pocket, red bell pepper slices, applesauce and cubes of cheese. 4. Hard boiled egg, muffin/bread/pita pocket, cheese stick or cubes, pears, zucchini spears. 5. Ham, cheese slices, apples and whole grain crackers with cut veggie of your choice. 6. Whole grain crackers, Havarti cheese slices, strawberries, carrots, and hummus (for dipping). 7. Egg salad, whole grain crackers, zucchini muffin, berry/yogurt/spinach smoothie pop, and frozen peas. 8. Make a pasta salad with avocado, black beans, cheese, sliced cherry tomatoes. 9. Or a pasta salad with chunks of chicken, grapes, cucumber, dried cranberries, poppy seed dressing and a few sunflower seeds sprinkled on top. 10. Lunchbox quiches, served cold with apples, carrots, mini pancake or muffin, plain yogurt with frozen berries and a little maple syrup mixed in.